CareerSource Pinellas and CareerSource Tampa Bay have spent about $6 million on Visa and gas cards since 2014 . Top lawmakers want further investigations. 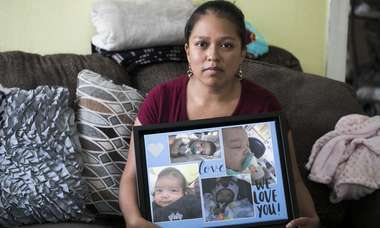 Tampa Bay's two largest job placement agencies handed out $6 million in Visa and gas cards since 2014 – all paid for with public tax dollars – and a share of that money went to people who didn't use the centers to find work and never had to account for how they spent it. A number of recipients told the Tampa Bay Times that they received the gift cards simply for reporting to either office when they found jobs on their own. Many Florida job centers offer to pay for gas, clothes or tools, usually for people who most need financial help to get work. But CareerSource Tampa Bay, which serves Hillsborough County, gave out far more cards than any other jobs center in the state. CareerSource Pinellas ranked fourth among the state's two dozen career centers. The Times interviewed more than 50 people, including current and former CareerSource employees and individuals who received the cards; reviewed hundreds of pages of public records; and analyzed two databases to calculate how the agencies distributed the money. The agencies used Visa cards to pay people for details about their new jobs. The centers then took credit for some of those job placements in reports to the state. Two-thirds went to people who were not on public assistance, though the money is supposed to help those in need. Nearly 700 received $1,000 or more, including many who already had jobs and never asked CareerSource for help. CareerSource workers mailed out thousands of cards, totaling more than $240,000, without checking to make sure they reached the intended recipients. Juditte Dorcy, the interim director of CareerSource Tampa Bay, acknowledged that her staff needs to improve stewardship of the cards. They are intended for those who can't afford transportation or tools that could help them find employment, she said. "We want to spend our money, but we want to be safe about it," she said. Kerry Myers, a lawyer and former FBI agent who teaches forensic accounting at the University of South Florida, called the use of the cards a "red flag" that should trigger further investigation. Myers said the cards "are the same as cash and carry a high risk of embezzlement, theft, fraud, waste and abuse." The local job centers have long boasted they are the best in the Sunshine State at putting people to work. But the Florida Department of Economic Opportunity and U.S. Department of Labor are investigating both offices after a series of Times reports called their hiring numbers into question. Board members fired Edward Peachey, the president and CEO who ran both agencies, earlier this year, and county commissioners are overhauling the centers to provide stricter oversight. The manner in which the agencies distributed the cards shocked several lawmakers, who wondered whether any local CareerSource leaders broke the law. Florida's two U.S. senators have now asked the Labor Department to add the gift card program to its investigation. Sen. Marco Rubio said in a statement: "These latest revelations of fraud and abuse again demonstrate a total mismanagement of these programs. Bad actors should be on notice that this will not go away and they will pay the consequences for their wrongdoing." CareerSource Pinellas and CareerSource Tampa Bay used these control sheets to track how many gift and gas cards were in agency safes in Pinellas and Hillsborough counties. This sheet from December 2017 showed $254,860 in cards. Francis Ousley remembers CareerSource Pinellas couldn't help him improve his computer skills when he was out of work as a database developer last year. The classes were too easy. Before he stopped going, a counselor told Ousley, 28, she would send him money if he told her when and where he found a job on his own. He did, and the counselor sent him a $200 prepaid gift card, which he spent on tolls and gas. 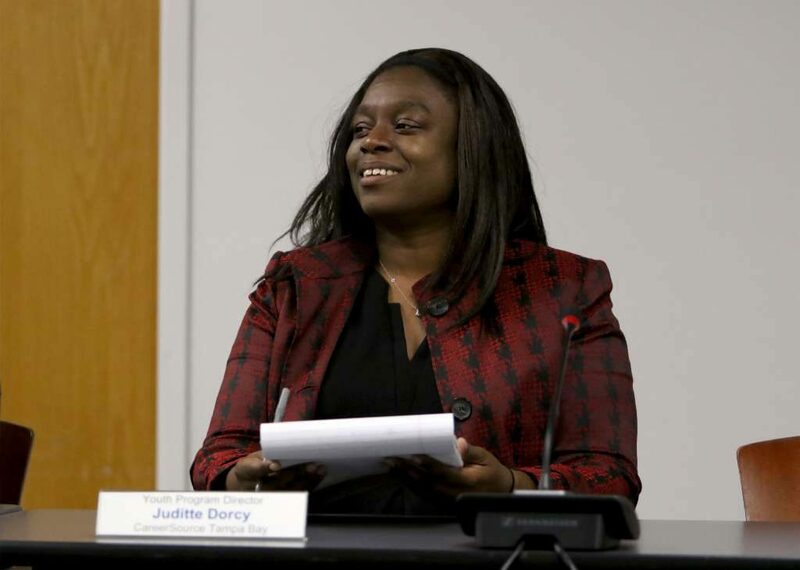 "It definitely took me by surprise," Ousley recalled. 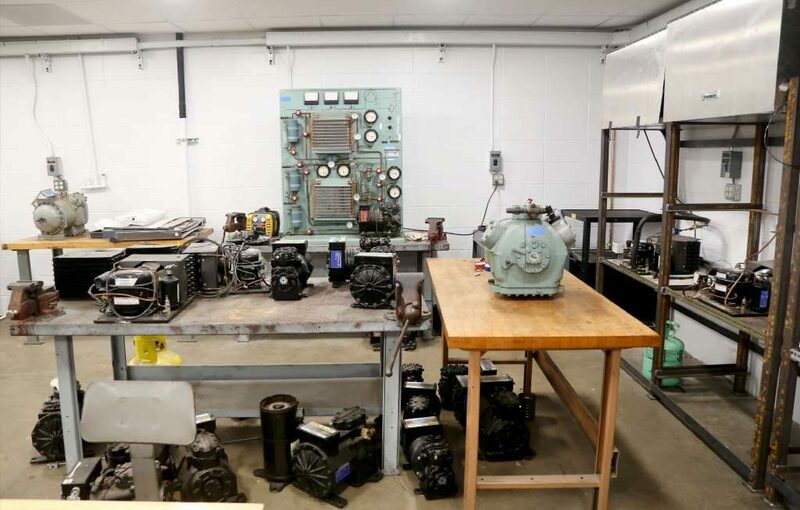 The state's CareerSource centers train jobseekers on basic skills, like interviewing and building resumes, and partner with others to teach specialty skills, such as welding and nursing. They then try to help people find work at hundreds of companies that sign up with CareerSource to accept referrals. People who collect unemployment benefits are required to check in at a local CareerSource office. After an initial session, many clients lose touch with their counselors and find work on their own, like Ousley. That makes it difficult for CareerSource to keep track of them. In Hillsborough and Pinellas, counselors paid them – through the cards – to check back in. CareerSource directors at other offices around Florida said they don't use the money that way. Josephine Johnson, a Hillsborough County teacher, received multiple emails in late 2016, months after she found a job on her own. One said she was "eligible for an incentive card due to finding employment. 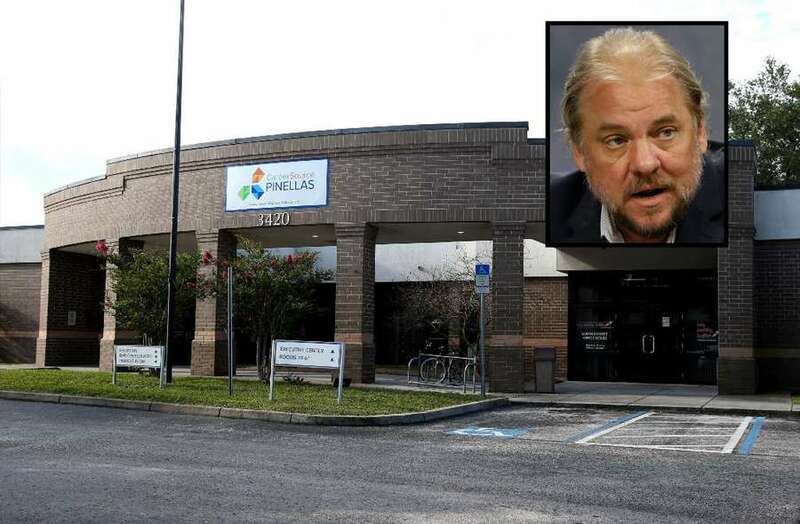 "How you obtained the job does not matter, whether you found it on your own or through CareerSource Pinellas," the email stated. Johnson didn't respond to the offer. Drake stopped going to CareerSource Pinellas in 2017 and later found a marketing position on her own. After receiving several requests for her hiring details, Drake provided the information and received a $50 gift card, which she spent at Bealls. Timothy Seckerson, 48, said he already had a lead on a temporary job with the U.S. Postal Service when he went to CareerSource Pinellas late last year. He ended up working for two weeks around the holidays. Records show CareerSource sent him a $50 gift card in January, which he said he used to cover his cellphone bill. "They said I could use it for anything," he said. The Times could not determine exactly how many cards were exchanged for hiring details, because the agencies did not log each transaction. "I didn't know about that," said Dorcy, who served as a top aide under Peachey when he oversaw both agencies. CareerSource Pinellas interim director Jennifer Brackney, another director under Peachey, declined to be interviewed for this article. At CareerSource Research Coast, which serves Indian River, Martin and St. Lucie counties, staffers use gift cards primarily as a bridge to help people get to a new job and off of public assistance, said president and CEO Brian Bauer. Richard Williams, executive director at CareerSource Chipola in the Panhandle, said his agency would never trade a gift card for filling out paperwork. The state DEO said it didn't know how the local agencies were using the cards but said it will hold officials accountable who didn't "act ethically and responsibly." "We expect every CareerSource board to be good stewards of taxpayer dollars," spokeswoman Tiffany Vause said in a statement. 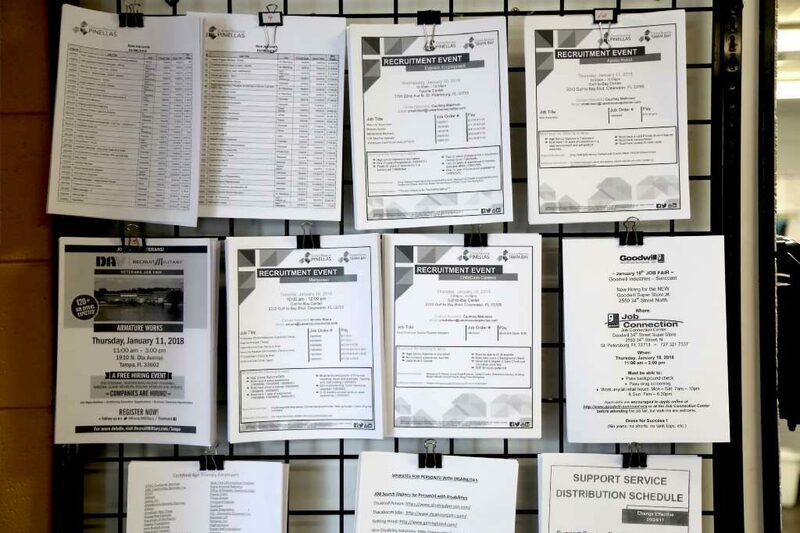 Hundreds of people who collected cards from the job agencies got more than just a little gas money.Nearly 700 took in at least $1,000 in cards, 85 percent of them from CareerSource Tampa Bay, records show. A number of the biggest recipients were already employed when they were offered money. They were working full time as apprentices and enrolled in training centers such as the Clearwater campus of Pinellas Technical College or through the International Union of Operating Engineers in Tampa. 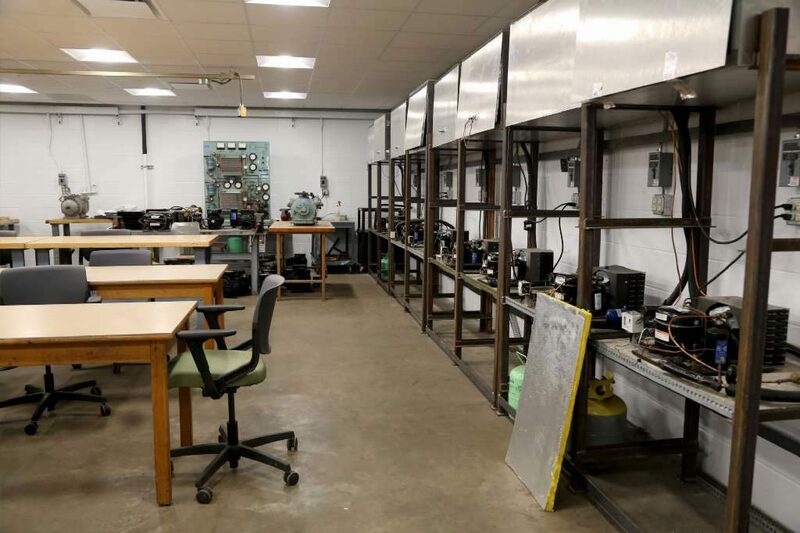 The Times interviewed 10 people in the apprentice programs at PTC, administered by St. Petersburg-based Refrigeration and Air Conditioning Contractors Association (RACCA). Each said they didn't go to CareerSource for help and filled out paperwork when agency employees offered the cards at class orientations. Most of them described the cards as "free money." "CareerSource said that was supposed to be confidential," Michael Howard, program director for the operating engineers, said about apprentices who got cards. "I can't talk to you." Union officials did not return calls for comment. Cheryl Harris, the executive director of RACCA, said CareerSource approached her organization about giving cards to the heating, ventilation and air conditioning (HVAC) apprentices. "We were not privy to how they handed (the cards) out," she said. Aaron Mohammadi, an HVAC apprentice, received 28 cards worth $3,700 — the most in Pinellas County. He received five $200 cards on Nov. 7, 2016 and another six $200 cards on Nov. 2, 2017, records show. CareerSource, he said, gave him a $100 card each month for gas after he sent a text or email to confirm he remained in the program. "They showed up at orientation and gave us this whole spiel" on how to fill out paperwork, he said "It was pretty easy actually." Benjamin Decker, another HVAC apprentice, collected $3,400. Before getting the cards, he said, career counselors required students to make a list of tools they wanted to buy. Shaun Size, who operates cranes as a member of the International Union of Operating Engineers, said he bought a hammer, a hard hat, a tool belt and work boots when he got the first of his cards totaling $1,600. He also said he never went to CareerSource for help. During an interview, Dorcy was surprised when the Times showed her a list of the hundreds of people who collected more than $1,000 in cards. Career counselors, she said, have an obligation to make sure recipients qualify. People who get the cards must declare they have a financial need, according to Dorcy, and counselors expect honesty. She vowed to investigate why so many people received multiple cards. "Maybe there is something we can do to look into this so there is some credibility there," she said. Robin King, president and CEO of CareerSource Flagler Volusia on the state's East Coast, said the agency caps the cards at $200 per person, and each recipient must meet stringent guidelines, such as being unemployed or receiving public assistance. Williams, of CareerSource Chipola, said his agency buys tools, uniforms, books and other supplies for trainees straight from vendors, rather than handing out cards. "We want to make sure it gets spent on what you're supposed to be doing with it," he said. CareerSource Tampa Bay and CareerSource Pinellas used these tracking sheets to keep count of prepaid gift and gas cards in its numerous offices. 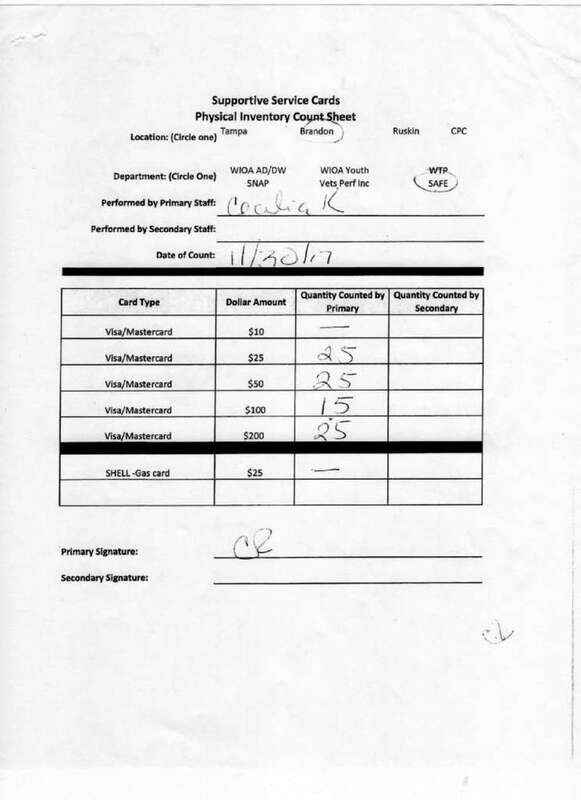 This sheet shows that no employee perfomed a second count to verify the number of cards in a Brandon office in November 2017. A Pinellas employee was accused of stealing $6,700 cards this year from an office in St. Petersburg. Though they dealt with larger sums of money than nearly all of their peers, the local CareerSource offices put in place fewer checks on their gift card program and eschewed common oversight practices. Several CareerSource officials in other parts of the state told the Times they require jobseekers to sign paperwork in person to receive cards. But not in Tampa Bay. In thousands of cases, CareerSource Pinellas staffers sent cards worth a total of $242,000 to people by mail and recorded them as a "mailout." CareerSource Tampa Bay records do not list a code for mailed cards, but Dorcy acknowledged the practice. The center used addresses for unemployed job seekers that were logged into a database, Dorcy said. But staffers did not follow up to make sure the cards were received by the right people. Myers, the USF professor, said forensic accountants would urge against sending prepaid cards by mail because "it is the same as mailing cash." In multiple cases, CareerSource records indicate someone was paid who later told the Times they didn't receive a gift card. Valerie Tooma, a human resources professional, and Glenna Wiseman, who works in nursing and home healthcare, said they never got their cards in 2016 and were surprised to be listed as recipients. 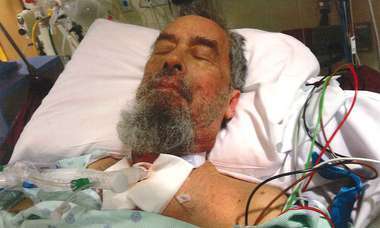 "That's a joke," Wiseman said. "That's not true." Barry Clark, who enrolled at CareerSource Tampa Bay when he filed for unemployment in early 2017, also found a job on his own and provided the information. But a gift card never arrived. "How many other people did this happen to?" he said. Some other agencies use reloadable gift cards, only adding money when job seekers complete training or specified tasks. Some give out gift cards for specific stores, like Walmart, limiting where the money can be used. Records show that most of the gift cards distributed by the local CareerSource offices could be spent anywhere. They doled out about six times as much in prepaid Visa cards – more than $5 million – than in gas cards. CareerSource staffers are supposed to run inventory checks on the gift cards each month, with two different employees conducting separate counts. But multiple CareerSource Tampa Bay inventory sheets provided to the Times dating to last November only had one count. Dorcy acknowledged that they did not follow proper procedures and blamed it on short staffing. "They have been counseled," she said. Earlier this year, a former employee was arrested. Over the course of several months, police said, the woman had stolen $6,700 in gas cards from her office. Prepaid gift cards also were used to reward employees at the two job centers. Peachey gave $40,000 in cards to staffers but did not report that as income to the Internal Revenue Service, records show. Interim leaders at the agencies now admit that was wrong. Administrators said the agencies bought those cards with tax dollars but later reimbursed the money from private donations and fees collected at job fairs. "We had different programs where we had recognition," Dorcy said. "That's not something we're continuing." 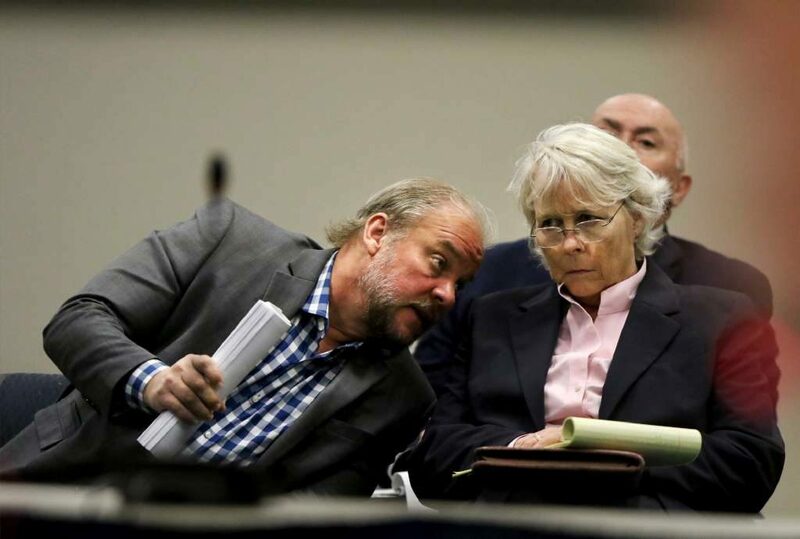 Peachey, according to Dorcy, told leaders to issue cards for contests like fundraising drives for the agency's struggling Science Center of Pinellas County. READ: CareerSource Pinellas bought a science center. Now the bill is coming due. Six current and former staffers told the Times they felt pressure from Peachey to donate money. If they did, they were eligible to win gift cards. But the rewards were not spread out evenly. 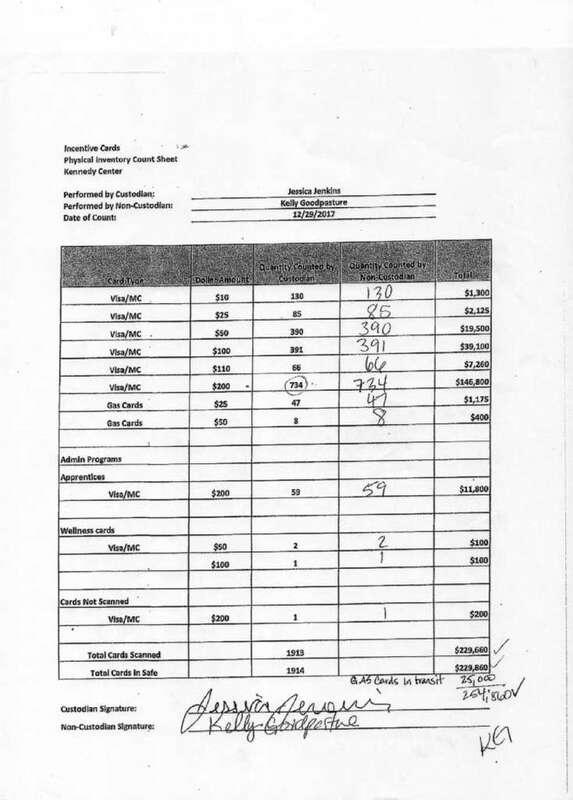 High-ranking administrators and their relatives were at the top, records show, including director Kristin Dailey and her husband, Michael ($2,125), and Human Resources director Alice Cobb and her daughter, Lindsey, ($1,950). CareerSource Pinellas board chair Jack Geller declined to talk at length about how Peachey distributed the cards. Elected officials in Tampa Bay had no idea that the local job centers had spent so much on cards and handed them out so freely. Pinellas Commissioner Charlie Justice called it "flabbergasting." "You have either base financial mismanagement, or worst-case scenario just outright financial corruption," he said. READ: They were supposed to watch over CareerSource. Many didn't show up. U.S. Sen. Bill Nelson said he alerted federal regulators about the Times' latest findings. Dorcy said federal and state auditors have already told the agencies they need to implement better practices. Those include rotating employees who verify and count the cards and training staffers annually. Two other lawmakers called for further investigation into what they speculated could be possible criminal violations. U.S. Rep. Charlie Crist, D-St. Petersburg, said in a statement that "these latest reports of rampant fraud at CareerSource show the corruption was worse than we feared. "As the misdeeds pile up, and grow in severity, justice must be served." 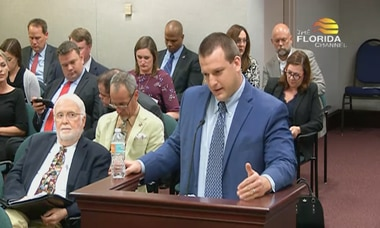 State Rep. Chris Sprowls, a former prosecutor and Palm Harbor Republican, said CareerSource immediately needs better oversight. "This is what happens when organizations have access to large sums of money and operate with little oversight and no transparency." Senior news researcher John Martin contributed to this report. Contact Mark Puente at [email protected] or (727) 892-2996 . Follow @MarkPuente. Contact Zachary T. Sampson at [email protected] or (727) 893-8804. Follow @ZackSampson.